The Blue Marlin needs no introduction. For fifteen years, this haven for Southern cuisine has been serving the patrons of Columbia, SC restaurantssome of the best Low Country dishes you can find. From New Orleans Seafood Gumbo to Shrimp and Grits (not to mention hand-cut steaks), the Blue Marin has a wide variety of savory samplings from the Louisiana shores all the way up to the Carolina’s. Upon walking into the Blue Marlin, you immediately take notice of the beautiful, slightly abstract rendition of the great blue billfish swimming above the bar. This glowing blue pane of glass gives a significant contribution to the elegant and tasteful atmosphere. Being a fisherman, I have always found myself drawn to anything even slightly marine and I imagine myself 40 years from now, my bank account healthy enough to weather the storm that is a bar menu filled with top-shelf infused cocktails, sitting at the bar and offering ever-escalating bids for that captivating work of art. The hostess found us a spot in a comfortable wooden booth and we hungrily perused the menu for our meal. This is where it gets tough. I had my stomach set on a “Low Country Classic” and was wavering between the “Original Blue Marlin Shrimp and Grits” with Adluh grits, andouille sausage, and tasso gravy, and the “Charleston Crab Cakes” paired with garlic mashed potatoes, sauteed green beans, sweet onion remoulade, and roasted corn salsa. A difficult choice, a bit like choosing between chocolate chip and mint-chocolate chip. Either way, you are still getting something delicious. 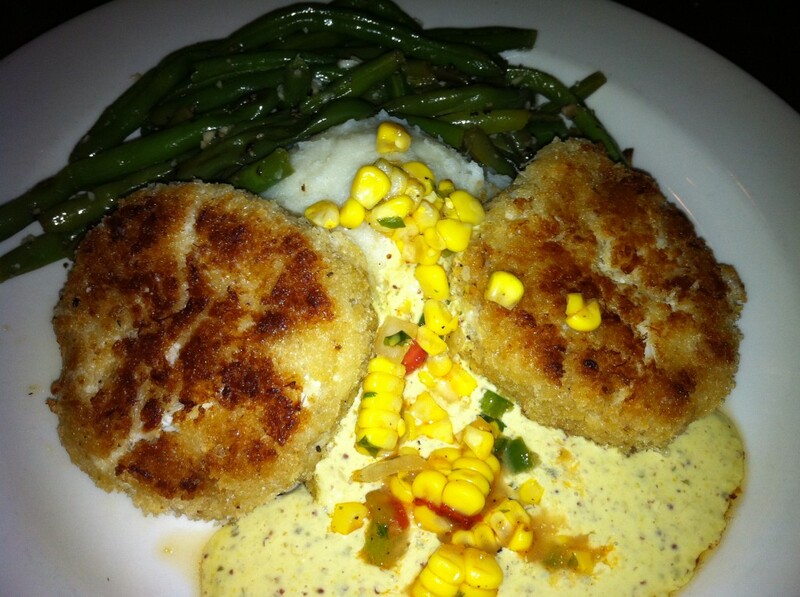 Mint-chocola…err, Crab Cakes it is! And what a wonderful low country treat these cakes were. Lump and claw crab meat breaded and then skillfully crisped on a skillet. A hefty chunk of crab, a dab of the sweet onion and you have a fork-full of Southern heaven. Before you know it your fork is diving back for a taste of garlic mashers and corn, or fresh green beans. An incredible dish. Now for a taste of the “Grilled Teriyaki Salmon.” The grilled salmon is bathed in a sweet Teriyaki glaze, with seasoned grilled asparagus and a miners delight, roasted Yukon gold potatoes. You won’t find salmon swimming off the coast of the Carolina’s, but that doesn’t mean you shouldn’t be able to enjoy this delicious item. Between your entree, the traditional bread and butter, and any appetizers that might catch your eye, make sure to leave room for The Blue Marlin’s complimentary collard greens. Wow. These. are. good. The Blue Marlin certainly delivers on this southern staple. As well as the entire meal. 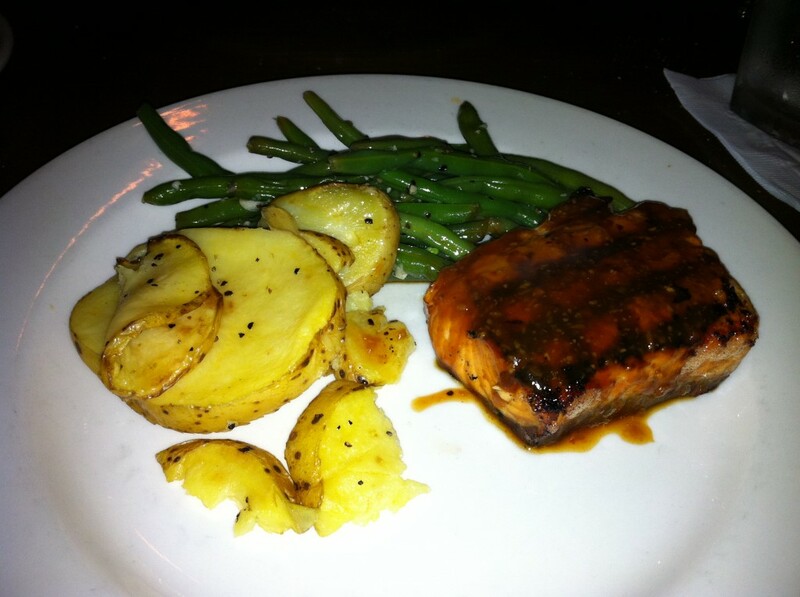 Our dinner at The Blue Marlin was mouthwateringly memorable. If you have never been, you need to go. If it’s been a while, it’s about that time. And if you are a regular, then a tip-of-the-hat to you. The Blue Marlin is located at the center of the Vista, just off of Gervais. Perfect for two, lunch, or a nice night our with the whole family (leave the 5 year-old at home), and be sure to consider the Vista Room for your next business or social event. The Blue Marlin’s website is located here where you can find the menu and anything else you care to know about the restaurant. Enjoy! And if you are looking for a Fine Dining Columbia, SC Restaurant or Romantic Columbia, SC Restaurant, you found one.